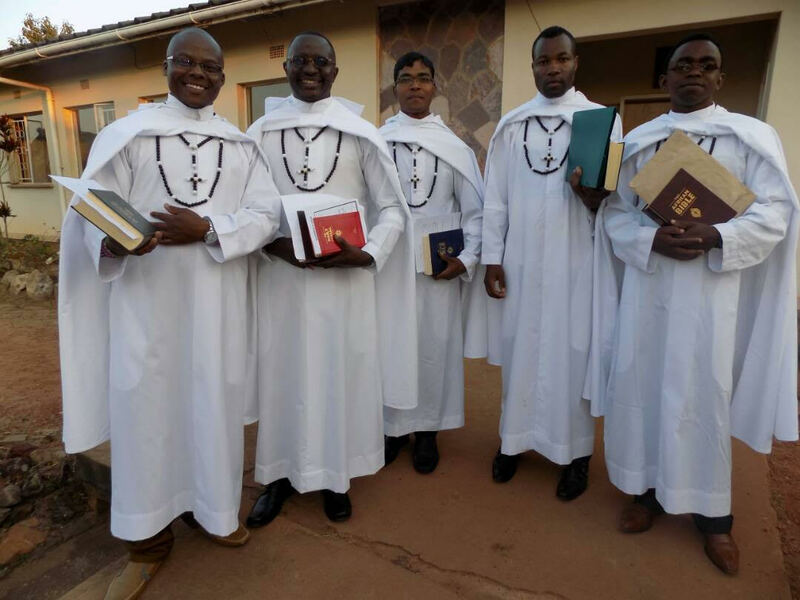 In order to commemorate the 150 years of the foundation of the Society of the Missionaries of Africa, the diocese of Chipata expressed its gratitude to the White Fathers by organising a pilgrimage of faith in Lumimba Parish run by our confreres. 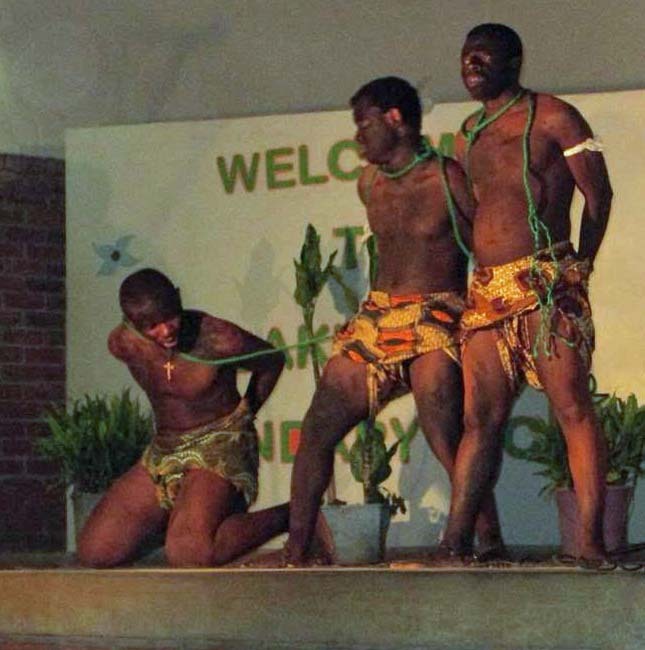 On Saturday 20th October, a number of activities were held in Chasera; poetry, a play, a traditional dance presented by the students of the formation house in Chipata and football matches. Were present Bishop George Lungu, brethren from other Christian denominations and representatives from the Muslim community. At the Sunday Eucharistic celebration, honourable chief Mwanya attested her happiness and the gratefulness of the people of Chasera for the work of our ancestors in the mission. She also expressed her thankfulness for the education and health facilities the missionaries have been given to the people of Chasera. She concluded: zikomo kwambiri, which means ‘‘thank you very much’’. Bishop George Lungu expressed his joy of having missionaries in his diocese. He also prayed for the first confreres who planted the Catholic faith in Chipata. 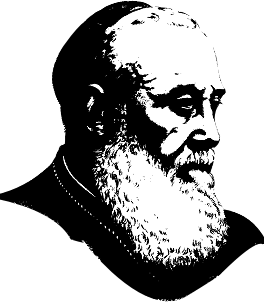 He encouraged all the religious over the diocese and the students of the Missionaries of Africa to take up the challenges of their time in order to bring the Gospel to all the whole world in the same spirit as the first missionaries did. All gratitude to the Missionaries of Africa, he said. He also invited the Christians to be grateful for what the confreres have done and are still doing for them by supporting them. He concluded his speech with a special word of gratitude to Father Toon van Kessel for his wonderful work in Chipata diocese. Finally, Father Adelarde Munishi thanked the Bishop, the whole diocese, the traditional believers and other denominations for their collaboration. We are all from one Family, the family of God – Banja Nyumba Ali modzi, he said. He expressed his gratitude to the Christians of Chasera for having hosted the celebration. In this atmosphere of great joy, the celebration ended with the final blessing of Bishop George Lungu after the missionaries had sung the Sancta Maria. 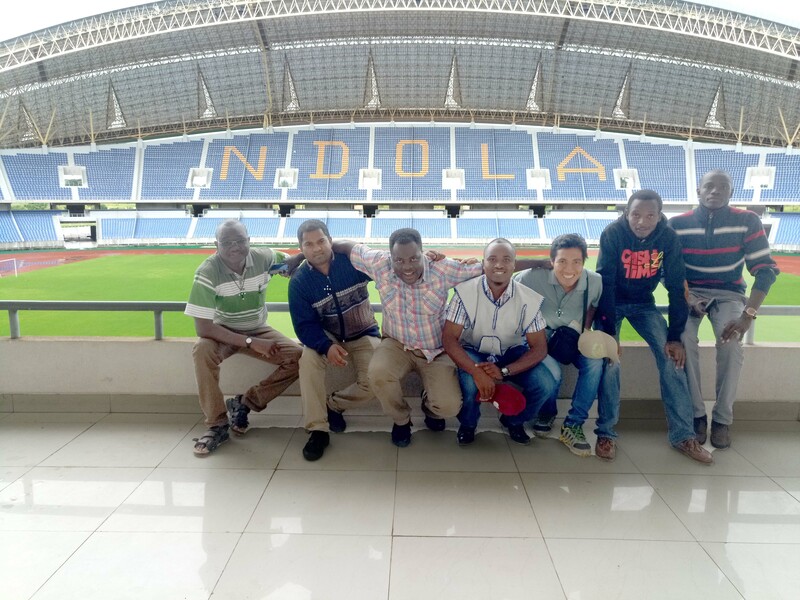 The stagiaires meeting is a way of being together, of strengthening our relationship from different corners of Zambia. 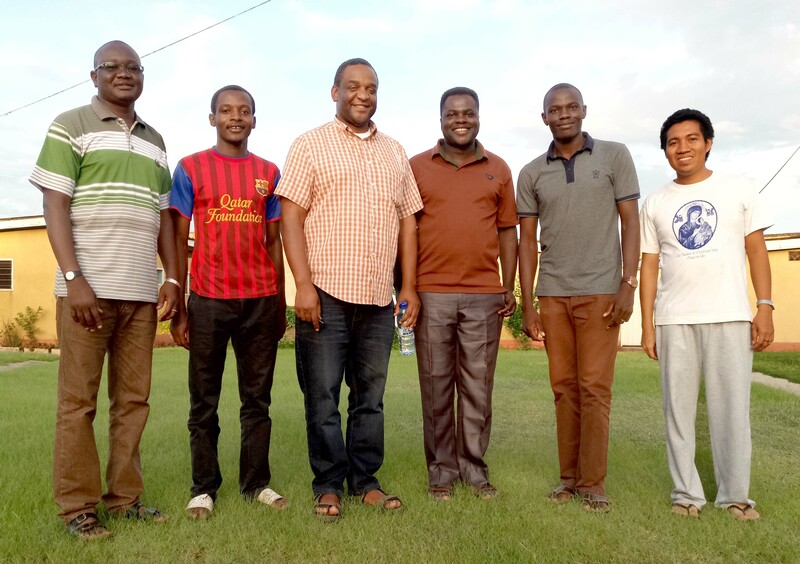 We were six stagiaires (five in their second year and one first year), and our coordinator: Emile Baguma, from Kasamba Parish/Mansa Diocese; Thierry Uyirwoth, from Saint Lawrence Parish/Lusaka Archdiocese; Jean-Marie Chishugi, from Namushakende Parish/Mongu Diocese; Emmanuel Kokpe, from St Annes’ parish/Kasama Archdiocese; Chandan Nayak, from Good Shepherd-Kabwata Parish/Lusaka Archdiocese and Hilario Villaver Jr., St John the Baptist-New Kaloko Parish/Ndola Diocese; and Fr. 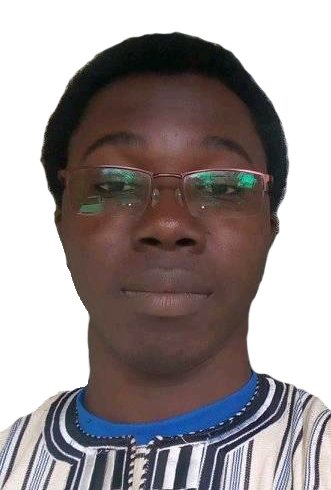 Camillo Konkobo, stagiaires’ coordinator. 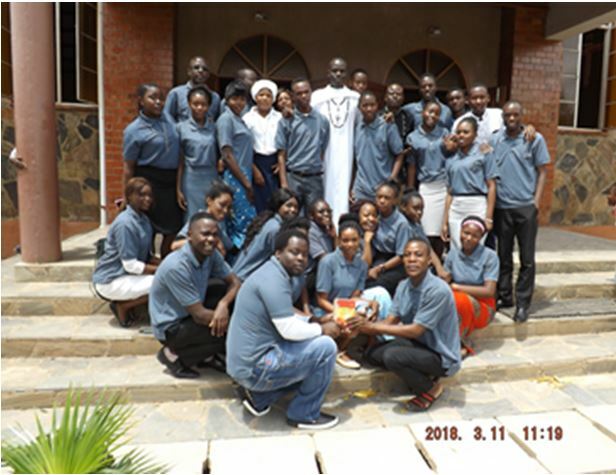 We held our meeting in our M.Afr community of Ndola, from the 26th February to the 3rd March 2018 with the assistance of our coordinator Fr. Camillo. We started with a recollection lead by Fr. Camillo on the theme “gratefulness” through meditating upon Luke 17, 11-19. We enjoyed having Masses and prayers together as stagiaires. We also joined the congregation at the Cathedral for the way of the cross on Friday. We consecrated this moment to know, deepen and share about our experiences on the apostolic training, with its joys and challenges. We had a good time of recreating and chatting together, with social colourful evening with the entire community of Ndola. We were privileged to welcome our provincial, Fr. Felix Phiri. He came to visit and hear from us. His words of encouragements were well received, and it gave us more flavour for the mission. We had time to relax and discover the Copperbelt especially some designated areas. Wherever we were going together, we were keeping our good spirit of concern for each other with a good atmosphere among us. We were not only united but one, “Esprit de corps”. We visited our parish and the training centre called “Bupe Mulenga”. The few Christians who were at the parish appreciated our visit talking to us in the local language with their hospitality and generosity. We are grateful to the Almighty God for bringing us together as one family. Moreover, we acknowledge the efforts made by the sector for supporting us in any kind of needs, and we thank the hosting community (Frs. Piet and Franciszek) for their hospitality and kindness towards us. On Friday 15th December at 4:30 pm, in the beautifully decorated chapel of the Merrivale Formation House in KwaZulu Natal, South Africa, eighteen young men were officially received in the Society of the Missionaries of Africa by pronouncing their Missionary Oath. Many relatives and friends had come from near and far to pray with them and witness this serious life commitment of these generous new confreres. Their Oath was received by Fr. Didier Sawadogo, M.Afr, one of the Assistants to the Superior General. The Provincial of the Southern Africa Province, Fr. Felix Phiri, M.Afr, as well as the Provincial Delegate for South Africa, Fr. Raymond McQuarrie, M.Afr, were also present. 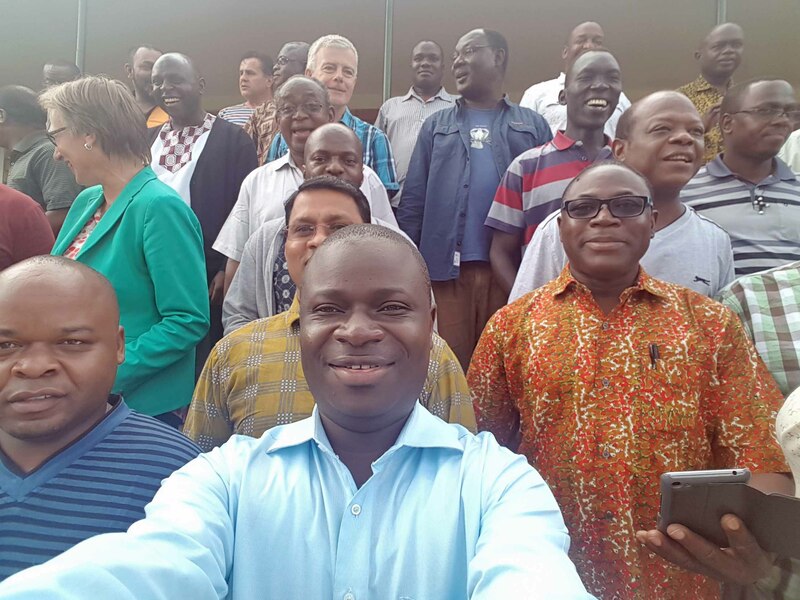 The occasion was also enhanced by the presence of Bishop Jan De Groef, M.Afr of Bethlehem Diocese (South Africa) and Bishop Sanctus Lino of Nebbi Diocese in Uganda. Our new confreres are: Maurice Aduol (Kenya), Jean-Pierre Badjanga Titi (DR Congo), Jean-Paul Basikaba (DR Congo), Stephen Beru (Ghana), Ryan Contamina (Philippines), Philippe Dakono (Mali), Siby Dominic (India), Francis Eze (Nigeria), Eric Kambale (DR Congo), Christopher Nkandu (Zambia), Silas Nsambimana (Burundi), Robert Ouedraogo (Burkina Faso), Justin Ramde (Burkina Faso), Elie Sango (DR Congo), Victor Sanou (Burkina Faso), Martin Somda (Burkina Faso), Jean-Baptiste Todjro (Togo) and Pierre Chanel Ulama (DR Congo). 18 New Priests for 2018! This makes a lot of 18’s! What a wonderful gift for our jubilee year, our 150 years of foundation! 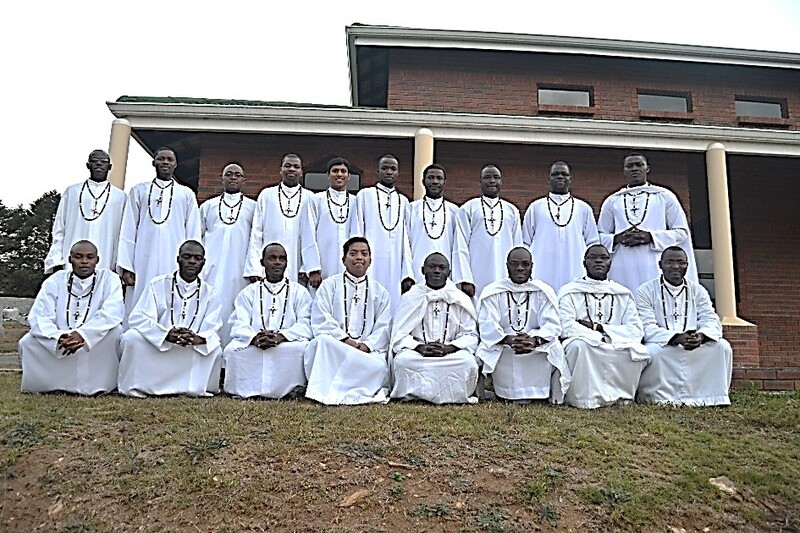 Indeed, the day after the Missionary Oath, on 16th December, in St. Vincent Parish Kwampumuza in South Africa, we had the pleasure to celebrate the ordinations to the diaconate of the same eighteen new confreres for the Missionaries of Africa and two others for the Dominicans (O.P.). 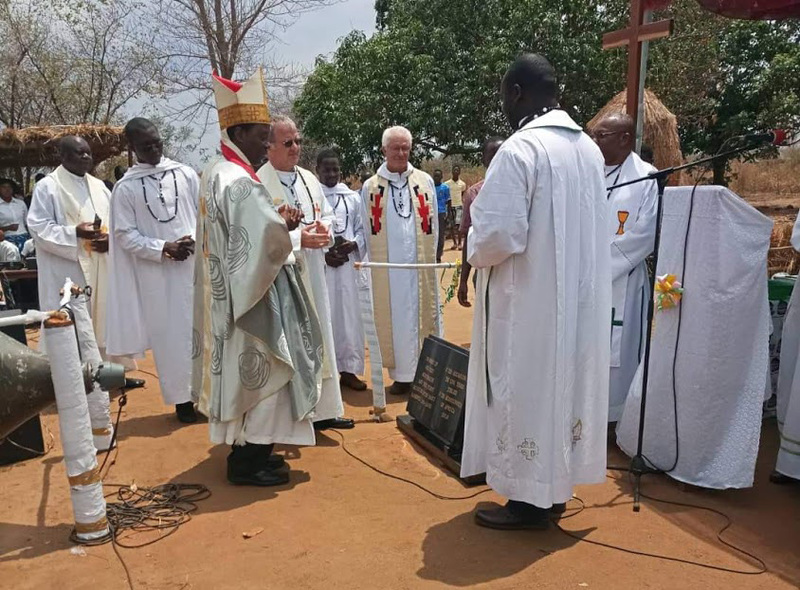 Cardinal Wilfrid Napier, ofm, Archbishop of Durban Archdiocese, presided the celebration assisted by Bishop Jan De Groef, Bishop Sanctus Lino of Nebbi Diocese in Uganda and over fifteen priests. Everything went smoothly with the enthusiastic and brilliant participation of the local parish choir, the altar servers and all the other liturgical ministers. By Deacon Jean-Baptiste Todjro, M.Afr. ‘I was glad when I heard them say let us go to the house of the Lord’ Ps 122: 1. These words mark the beginning of our immediate preparation for our Missionary Oath and Diaconate Ordination. Indeed great was our joy to be accepted into the family of the Missionaries of Africa. One word was echoed strongly throughout the celebration of our Missionary Oath and Diaconate Ordination: FAMILY. Prior to the celebration of the oath, Didier Sawadogo, representing the Superior General, presented to us the message of the General Council by giving to each of us the positive affirmation of our Society which states: ‘Filled with the joy of the Gospel and guided by the Spirit, we are an intercultural missionary society with a family spirit. Sent out to the African world and wherever our charism is needed, for a prophetic mission of encounter and of witness to the love of God’ (Capitular Acts 2016:17). It is with this sense of belonging and willingness that we responded YES to the call of God and the desire of making God’s love known and flourish in the African world. The word FAMILY was at the heart of the homily of Cardinal Wilfrid Napier who in addressing us insisted that we have to participate in the mission of the Church and identify the challenges that families are facing as our primary mission in collaboration with the universal Church. As such one can boldly say we are ordained to be APOSTLES TO FAMILIES, NOTHING BUT APOSTLES TO FAMILIES. We wish to thank all those who made this event possible: our community, our formators and provinces of origin who believed we can contribute positively to the Mission of Jesus Christ within the Society of the Missionaries of Africa. Our gratitude also goes to you, our parents, friends and confreres who graced this event with your presence or with a thought or a prayer. Please, continue praying for us and supporting us. À vous mes chers Missionnaires d’Afrique, l’amour est notre unique vocation. 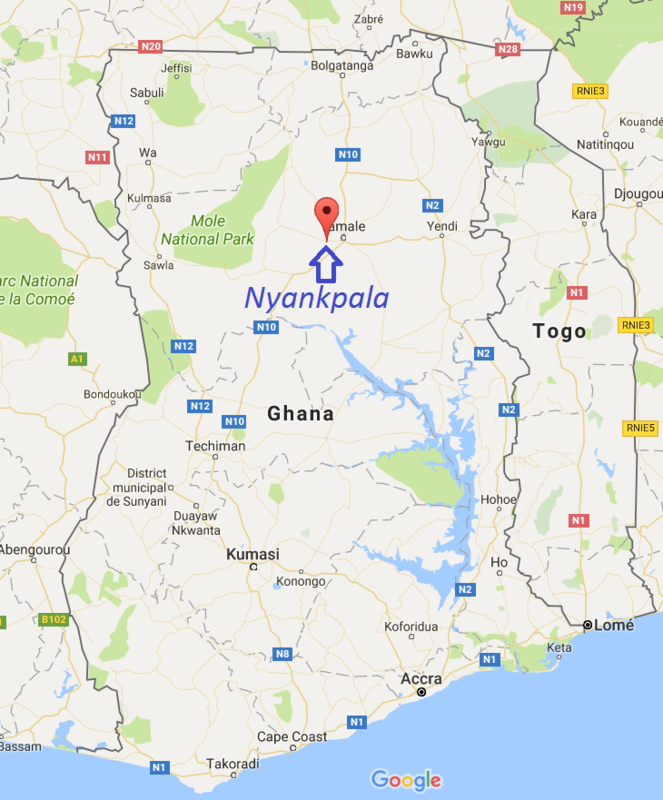 Dieu nous envoie en Afrique en mission, pour proclamer par notre vie son Amour. Aimons-nous d’un amour tendre et fidèle, soyons apôtres et rien que cela. Soyons unis pour que la vie soit plus belle, allons sans peur vers notre Dieu qui nous appelle. Nous sommes la présence, du Dieu de l’alliance. Qui nous parle dans le silence, Dieu d’amour et d’espérance. Nous sommes sa présence, ici en Afrique. Qui proclame ses merveilles, Dieu d’amour et d’un nouveau jour. We are the presence, of God in Africa. Who speaks to us in the silence, God of love and God of hope. We are God’s presence, here in Africa. That proclaims God’s great deeds, God of love and of a new day. FENZA organised and hosted the launch of the documentary video “The Earth Our Home: conservation for integrity of creation” by Fr Venerato Babaine, the Provincial Delegate of the Missionaries of Africa in Zambia. 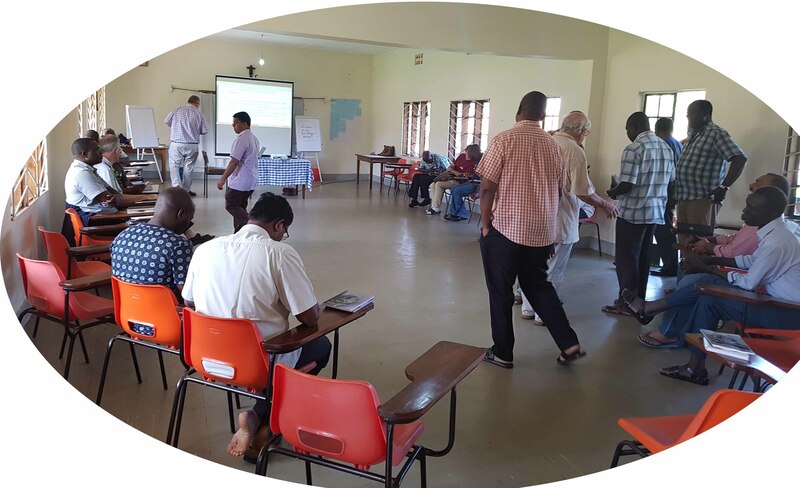 The event was held at FENZA multipurpose hall on 28th October 2017 from 14:00 to 16:30. The launch was attended by dozens of people, including Missionaries of Africa, some religious, friends of FENZA and people who heard of the event. Considering the publicity that preceded the launch, and the invitations that were extended to various people and organisations, the attendance was rather below expectation. Among the distinguished guests there were Fr Thomas Banda, the Diocesan Pastoral Coordinator of Lusaka Archdiocese, and Fr Felix Phiri, the Provincial of the Missionaries of Africa in Southern Africa, who was also a keynote speaker. In his opening speech, Fr Babaine spoke of the events that inspired him to embark in the production of the video. He disclosed that it is a combination of his childhood experience in Uganda, his missionary journeys in many countries of Africa and Europe, and the “cry of the Earth” that led him to the making of the documentary. He also said that he drew inspiration from the recent encyclical of Pope Francis, “Laudato Si”. In his speech, Fr. Babaine explained the purpose of the documentary. He said that the purpose of the video is to show the beauty of nature in Zambia, and to alert people on the devastation of this beautiful countryside due to human activity and lack of care. He said that the exciting thing about the documentary is that it exposed the exemplary efforts of conservation that are undertaken by many people and organisations in parts of Zambia. Fr Felix Phiri in his address expanded on the place of creation in the Christian faith teaching and tradition. He explained how the integrity of creation has gained attention in the Church’s mission in the last decades and that it cannot be overlooked anymore today. He cited examples of concerns for the earth and creation from other religions. He concluded by commending Fr Babaine for producing the documentary, which he said is timely and would be another contribution to the care of the earth. The producer of the video, the Catholic Media Services (CMS), was also given an opportunity to address the audience. Speaking on behalf of the director of CMS, Mr Mwamainda said that the CMS was delighted to produce yet another documentary for the Catholic pastoral work. Helping the Catholic Church, and pastoral workers to evangelise through the media, he said, is their vocation; and they are looking forward to being called upon for more such endeavours. After these speeches, the video was ceremoniously launched; and the audience could view the documentary. This was followed by a short discussion. Most contributors welcomed the video and recommended it to be used in gatherings, schools and various forums as a tool to promote the care for creation. One intervener suggested that the content of the video to be put on other media such as YouTube for a wider reach. It was another interesting event at FENZA, attended by concerned and supportive friends of the earth. “The Earth Our Home” is a short and easy-to-watch movie which combines a show of the beautiful nature in Zambia, a public education on the environment and a presentation of laudable works of conservation, which aims to inspire people to care for the earth, our home. The DVD is available for purchase at FENZA and at the Missionaries of Africa Provincial House, for K50. Venerato Babaine, M.Afr, DVD Producer – November 01, 2017. New academic year 2017-2018 opening Mass in Abidjan, Ivory Coast. The opening Mass of the new academic year in Abidjan took place on Friday September 15, 2017. The first purpose of the event was to welcome the new members of the formation house called the Lavigerie Centre. Paul Pipe started his first year while Joseph Goodwell Levison made his declaration of intention as a second-year student. Both of them are Malawians from the Southern Africa Province (SAP). A third-year student is also from SAP; Brian Banda from Zambia. The new rector, Fr. François Xavier Bigeziki was also presented to the community at Mass. It is a custom in Western part of Africa to welcome visitors with a cup of water. This local ritual was performed to welcome the new rector and students once they have knocked at the door outside the campus. Then, the visitors were being asked to express their intention of coming. Few pictures below are showing this cultural behaviour. The new academic year starts on Monday 18th September. We wish them all a fruitful year. On behalf of my fellow brothers here in Abidjan and my own behalf, we appreciate and recognize always the members from SAP and those working in SAP for your unceasing moral, financial and spiritual support. Golden Jubilee of priesthood of Fr Piet van Heijst, M.Afr. 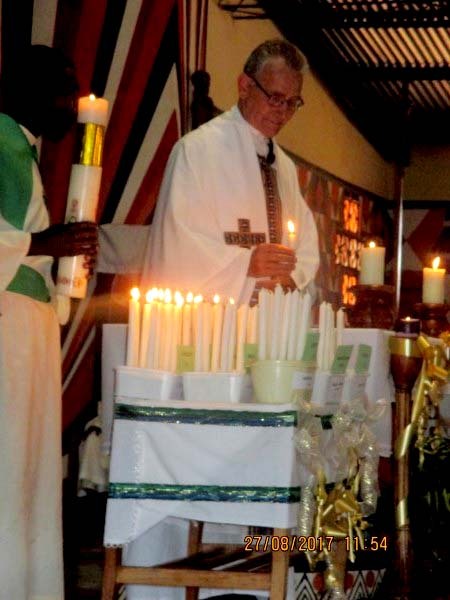 Fr Piet van Heijst celebrated his Golden Jubilee as a priest at St John the Baptist Catholic Church New-Kaloko in Ndola on August 27. The celebration took place in a joyful atmosphere led by the Parish-Priest Fr Francis Scszurek assisted by Fr Didasio Mwanza and the entire church council. A number of delegations came from various parishes and institutions as well as Dominicans and Child Jesus Sisters. 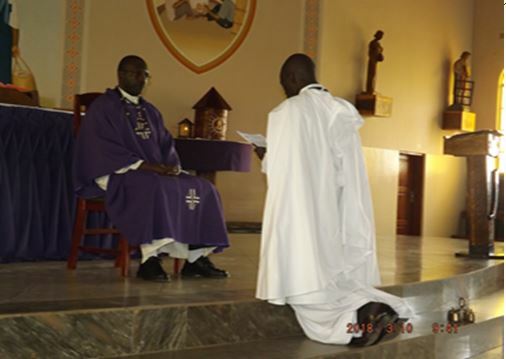 The Vicar General, Fr Paul Simukanzi represented Bishop Justin Mulenga of Mpika. 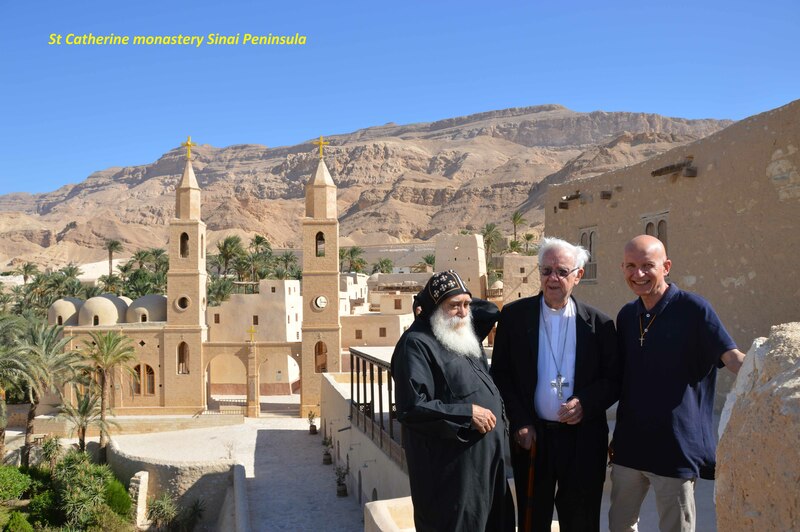 Fr van Heijst has been working in his diocese for the past 40 years. Friends came from Chilonga, Mpika, Serenje and from Twatasha and Kawama in Kitwe. In his preaching, Fr Camille Konkobo highlighted the joy felt by the Jubilerian, a priest dedicated to the people and the sick who loves the Zambian. Christian families and small Christian Communities were encouraged to promote vocations in the Church. 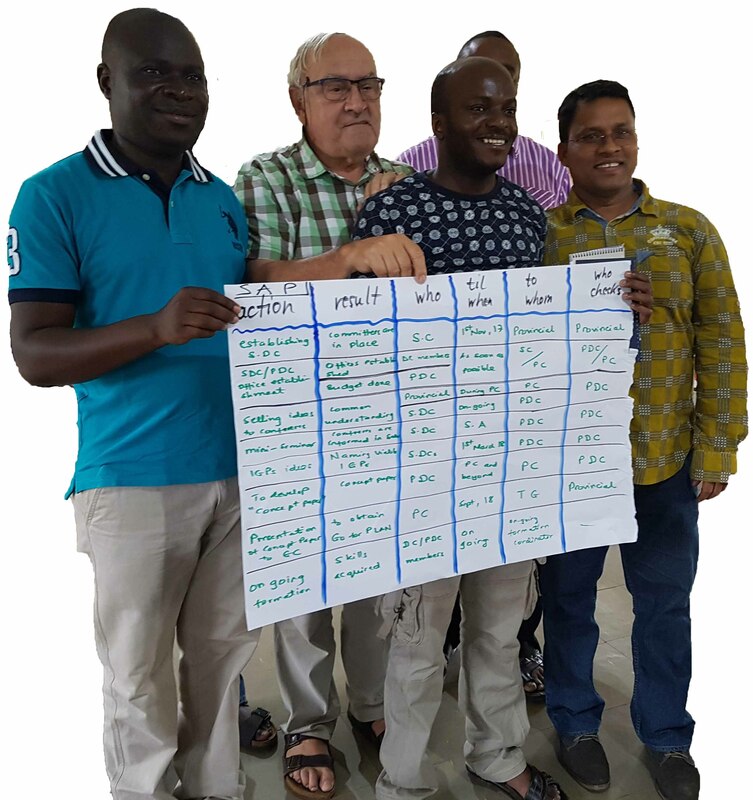 Recently, Fr van Heijst has been the chaplain of Ndola General Hospital while helping the Parish-Priest. He is a dedicated and hardworking Missionary of Africa. In the thanksgiving Mass, 50 candles were lit as a symbol of faith in all the places where Fr van Heijst worked. It was very touchy and emotional, a great moment of prayer. After Mass, a group of women made a sketch depicting the call to priesthood. We wish you many more years in your ministry and may you continue being a model, a pastor, an image of Christ to the people you are sent to. Happy ministry and keep your beautiful smiling face always! Camille Konkobo, M.Afr, Vocation Director for Zambia based at Kolibo Vocation Centre, Serenje, Zambia. Father Andreas Edele comes from Stetten in Hohenzollern. There he was born on 24 January 1934. After the Second World War he came to the mission school in Haigerloch and graduated from high school in Grosskrotzenburg. This was followed by the Philosophy Studies at the White Fathers in Trier. He was then appointed Novitiate to Alexandria Bay in the USA and then went to the theological studies of the African Missionaries in Eastview, Canada. In Ottawa, he was ordained a priest on September 19, He was appointed to the mission to Malawi, where he was first employed in parish work after a language course, and from 1961 worked for two years as secretary for education. From 1964 he was a lecturer in theology and until 1967 was a professor at the University of the White Fathers in Trier. 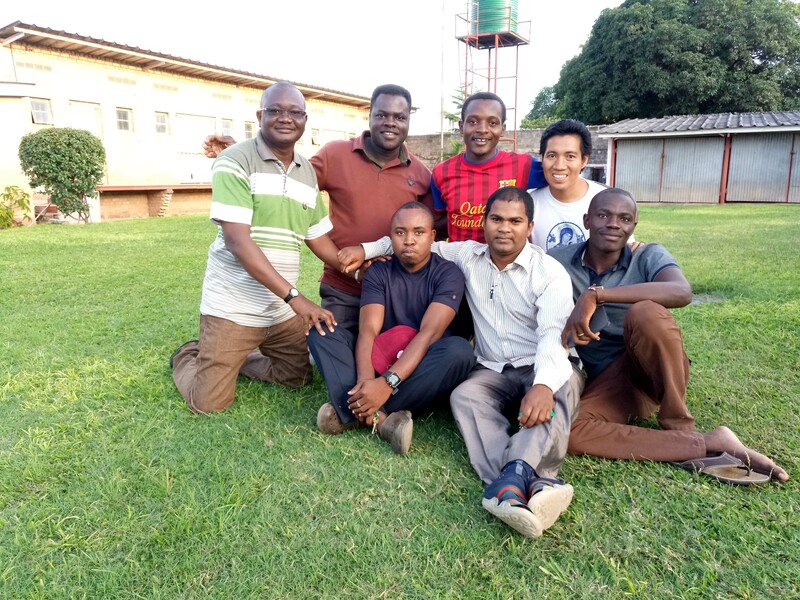 After his home mission, his journey back to Africa, this time to Lusaka in Zambia, where he was again active in pastoral care. In 1982 he returned to Germany and worked for Missio in Aachen. 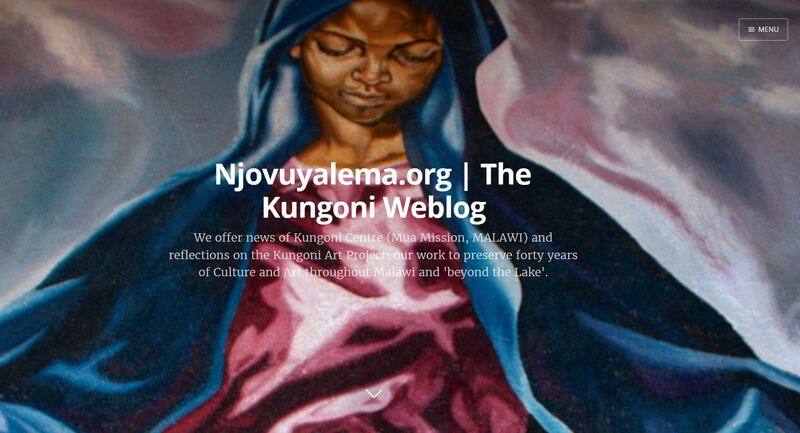 He then went back to the mission to Malawi, where he worked in Kanengo and Mua in pastoral care. At the beginning of the nineties, his eyes forced him to undergo surgery, and in the following years he came back to eye control again and again. In 1993 he was finally appointed home, was a few years in Trier, and from 2003 to 2008 he took over the management of the mission house in Haigerloch. During the years in Germany, he has never forgotten Africa, but from his own location, has done his best for the people of Africa. 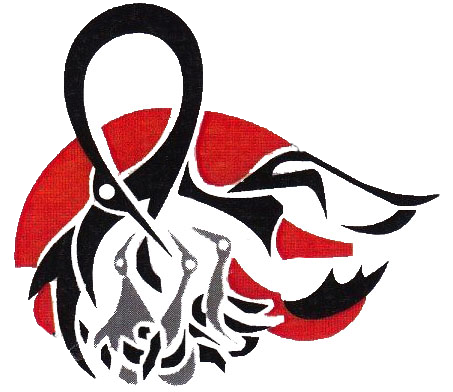 On July 22, Father Edele died after a long illness at the hospital in Balingen. My Personal Odyssey from Head to Heart. My heartfelt gratitude goes to God, my formators and fellow novices who accompanied me up to the end from the beginning of the spiritual year. It has been a nice experience with which I feel fulfilled. We started eighteen novices and ended seventeen. There are many factors that inspired us to be committed up to the end. That was observance of our community project that comprised five objectives: to know the will of God in my life, to deepen my relationship with Jesus, to live in a fraternal and intercultural community, to deepen the knowledge and charism of the Society of the Missionaries of Africa and to know who I am. Community life was not so much spoken of but lived. The concern of the other fetched a kind of bond with cords that cannot be broken. Also, prayer and Jesus were at the centre of our stay, for we had much time of reflection, prayer, meditation, silence and retreats which helped us deepen our relationship with Jesus. In fact, at the end of the spiritual year there is one common word that comes so often on the tongue of each novice. And that is, “Jesus Christ” from whom priestly vocation precedes. We indeed grew and we continuously grow in knowledge and grace of Jesus Christ to him be glory in present and in eternity. We had many occasions that brought a sense of joy and belonging. In order for us to belong, we took the clothing ceremony seriously “Gandoura day” which is our identity in the Society of the Missionaries of Africa. The knowledge of the society was deepened in looking forward to listening to wisdom of old and keeping the dreams and visions of the young. To have a proper foundation of all that is good in life there is one aspect that brings more sense to my life. A sense of being loved by God. Indeed, God cannot hate His own hand. The Ignatian spirituality led us to be committed, have inner freedom to all created things and to come to the realisation that we are loved sinners who need God’s mercy. And that is what we will share in our apostolic training as we go for our apostolic training, also called ‘stage’, of two years. Be still and know that I am with you!